A modulation-crazy curveball from DMG, PitchFunk is a veritable gift for sound designers and electronic producers. Modulation madness! Gorgeous filter. Unique sound creation tool. Innovative delay feedback and filter interaction. Tons of presets. Poor MIDI implementation. Can get out of control if you're a novice. DMG Audio's output to date has comprised conventional plug-ins with a twist. Their Compassion compressor takes dynamic control to rude extremes, while the EQuality EQ is indeed pure quality. To describe their latest offering, PitchFunk, as quirky would be like saying Lady Gaga likes to show off a bit. This wayward beast careers from being totally out of control, through moments of pure magic, to serving as a straightforward delay or pitchshifter. 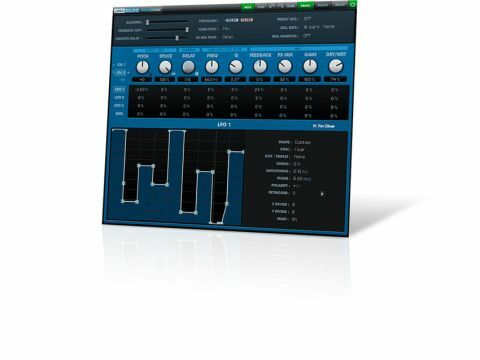 "PitchFunk is one of those plug-ins you can get lost in for hours, churning out an enormous variety of sounds"
PitchFunk is a two-channel plug-in (VST/AU/ RTAS) with three main effects elements: a filter, pitchshifter and a delay line, each with its own set of parameters. Nothing out of the ordinary there, you might think, but what really gives this plug the funk is its four-way modulation matrix (offering three LFOs and an envelope follower as sources), and the feedback circuits. Each modulation source can be assigned to any number of effect parameters by simply turning the relevant value in the matrix up or down from the 0% 'off' position. The topology of the effects is adjustable, enabling, for example, the filter to sit between the delay and feedback modules for some awesome dub effects. Pitchshift up or down is dialled in as a percentage or in pure semitone steps. Modulating pitch by anything more than a few cents is rarely going to give musically coherent results, but it's great for wild FX and general sonic madness - making the long feedback tail of a delay slide up n pitch, say. The Splice knob cuts up the audio like a granular synth and, using various algorithms, runs sections of it forwards and backwards - great for glitchy sliced beats. The delay is, as you'd expect, syncable to tempo. It comes in three flavours: Modern, Crunchy and Bit. The first sounds rich and warm, the other two sound 'old' and digital. The resonant filter boasts nine types (12/24/ 48dB LP and HP, 12/24 BP and 12dB Notch), while the gain stage dials in saturation to add colour. PitchFunk is one of those plug-ins you can get lost in for hours, churning out an enormous variety of sounds. But if you don't know what you're doing or you don't have something in mind, you can easily end up with garbage. "For intrepid sonic sculptors who love to noodle with filters and delays, PitchFunk is a must-have plug-in"
Learn its ways, though, and you'll find PitchFunk an incredibly innovative device. Recording the output as you mess with it is a particularly effective tactic, because happy accidents are common and can be cut up afterwards. Strangely for something so modulation-orientated, PitchFunk's MIDI implementation is very low-key, with the pitchwheel the only MIDI source (it targets the pitch knob). We expected CCs to be available for filter and delay at least. This can be easily worked around using the controller assignment system in just about any DAW, however. For intrepid sonic sculptors who love to noodle with filters and delays, PitchFunk is a must-have plug-in. The versatility of the modulation matrix and the bonkers results that can be achieved are successes in themselves, but beyond that, PitchFunk's complex web of signal interactions make it possible to create sounds you just couldn't get any other way.